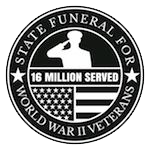 We cordially invite all current and retired military officers to join us in achieving the mission of State Funeral for World War II Veterans. We would like to get you involved in many ways, including sharing quotes and testimonials; sharing our “Salute with Petition” challenge with friends, colleagues and affiliated organizations; and writting letters to editors, serving on our media interview team and recording public service announcements and YouTube videos. We want to recognize all “Salutatorians” by name with their encouraging quotes on our website. In turn, we will support your interests and organizations wherever possible.